A water-based suspension concentrate of 9.1% Fipronil for post-construction termite applications, and to control perimeter pests. 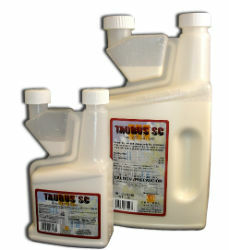 TAURUS SC is labeled for barrier applications targeting occasional invaders around structures. Treats for ants (including Crazy Ants), spiders (including Black Widow & Brown Recluse), Ticks, Cockroaches and many more insects. Apply at a rate of 4 gallons of dilution per 10 linear feet per foot of depth. Applied at a 0.8 fluid ounces per gallon (0.06% dilution) for most applications, 20 oz. makes 25 gallons, and 78 oz. makes 100 gallons of dilution.